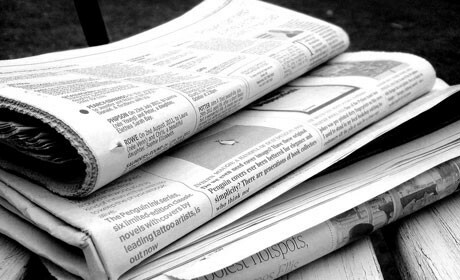 Figures published recently suggest that more than 90 per cent of newspaper reading still happens in print. This might come as a surprise given the gloomy assessments often made of the state of print media in the UK but, it turns out, we’re just not measuring success properly. In the digital age, understanding how audiences consume newspapers requires new methods. The key is having a comparable set of metrics. Print newspaper consumption is most commonly talked about in terms of the number of physical copies distributed per day. For online, it is how many pages have been read, and the number of unique browsing devices (laptops, smartphones, tablets and so on) that visited newspapers’ websites in a month. It is pretty obvious that these metrics cannot be directly compared. However, a much more direct comparison is possible if you look at time spent reading. When you look at the problem through this lens, it seems that reports of the death of print media may be greatly exaggerated. Newspapers might want to take note and rethink the way they measure success if they’d like to shore up their ever decreasing advertising revenues. Although online channels have increased newspapers' reach, looking at time spent reading paints a different picture. 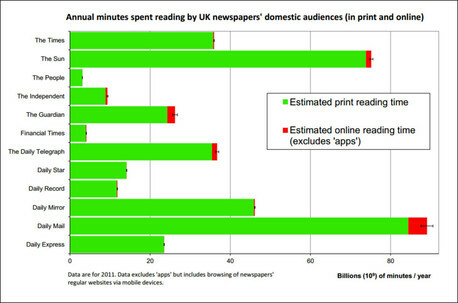 At least 96 per cent of the time spent with UK national newspapers by their domestic audience was in print. This excludes time spent on newspapers’ mobile and tablet apps but includes mobile access to newspaper sites through internet browsers. Estimated total annual minutes spent reading by the aggregated UK print and online readerships of each of 12 UK national newspapers, 2011. This metric also undermines the commonly held view that The Sun is the most popular newspaper in the UK. In fact, if you measure success as the amount of time a newspaper brand is looked at over a year by all its readers, the Daily Mail attracts about 20 per cent more attention than The Sun and about double that enjoyed by The Mirror. All this is not to say that the future is bright though. Across the 12 titles I studied, the average fall in time spent reading between 2007-2011 was at least 16 per cent. Only The Guardian managed to increase the time its domestic audience spent with the brand in print and online. 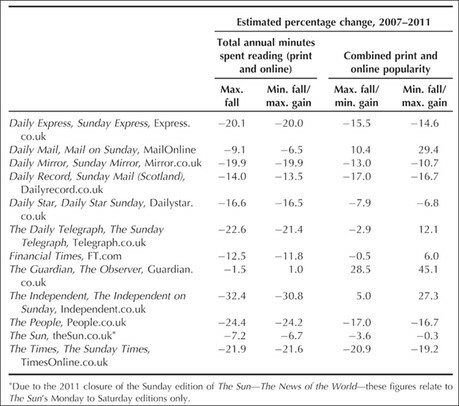 Estimated percentage changes in “total annual minutes spent reading” and “combined print and online popularity” for 12 UK national newspapers based on their aggregated domestic print and online readerships, 2007–2011. Digital Journalism (C) 2013 Taylor and Francis. In light of my study’s findings, newspapers might ask themselves whether they are reporting their consumption patterns in the most favourable light. Metrics such as “unique users” and “page impressions” look impressive when reported on a monthly basis. However they obscure the fact that newspapers’ print editions capture reader attention at a level hugely out of proportion to their popularity. Given that newspapers still get 86 per cent of their ad revenues from print, they have got an incentive to exercise greater influence on the evolution of audience measurement, and try to ensure engagement is reported with as much prominence as exposure. Neil Thurman does not work for, consult to, own shares in or receive funding from any company or organisation that would benefit from this article, and has no relevant affiliations.